A Modern Day Civil War Grandson. In this modern, highly sophisticated, fast moving, hi-tech world we live in today, it’s possible some of our grandchildren, or great grandchildren may never hear the words, Civil War, much less know much about it. So maybe I’d best write this column now, basically to clarify and understand the position and status of a fast disappearing breed. You see, there are few Civil War grandsons still standing in this world today. Correct me if I’m wrong. Introducing yours truly here folks, a Civil War Grandson. But to tell you the gospel truth, I really don’t know just how rare we are; how many are still living today? I have never found any statistics on the subject and I don’t know of any clubs, fraternities or associations to join. If I did, I’d probably join one. So please, if any of my readers know of such clubs or any Civil War Grandsons still living near my age, I’d love to hear from you. Pre-Civil War…… My story begins in Darby, (Deleware County) Pennsylvania during the 1830’s. 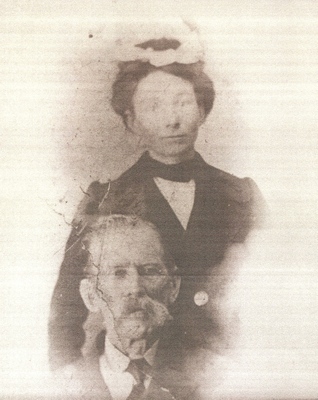 My great grandparents, William Ridgway and Margarette Olden, were married and produced four children. My grandfather, William Olden Ridgway was one of those four and was born in Darby in 1837. He had an older brother, Ephraim Inskeep Ridgway, born in 1834, plus two younger siblings. THE GOLD RUSH of 1849 was in full swing and thousands of over-zealous, eager folk were headed west to California, mainly by wagon train, or maybe any other way they could get there. About that same time, sometime during 1849, my great grandfather William, not participating in the “Westward Ho the Wagons” gold rush, went into Philadelphia on business. Darby was only 10 to 12 miles west of Philadelphia. While in town, he contacted the dreaded disease cholera. There was a serious outbreak; a very contagious cholera epidemic going throughout the nation during that time. Upon returning home, he transmitted the disease to his wife Margarette. They were both dead within a week, leaving four orphaned children who weren’t affected by the disease. My Grandfather William Olden Ridgway, one of the orphaned kids, was only twelve years old at the time. The four little children left without parents were taken in and raised by (their mother’s) Margarette Olden’s stepfather, Ephriam Inskeep. He operated two thriving mills on Muckinapattus Creek; a gristmill and a sawmill that were apparently very prosperous and kept exceptionally busy by local farmers. Inskeep apparently was a successful entrepreneur who owned a nice home and acreage. He later named his mill and their home village GlenOlden, Pennsylvania, in honor of the beautiful creek valley (a Glen) where they lived, and his stepdaughter’s maiden name, Olden. GlenOlden, Pennsylvania, today is a large bustling, thriving city of it’s own right; a Philadelphia suburb. In modern language, known as a “bed room” community with a current population of about 9000 residents, many of whom are commuters daily into Philadelphia. My wife and I visited there for a week last October. This entire family was known as Pennsylvania Dutch, hard working Quakers, a peace-loving breed strongly opposed to conflict, wars, fighting and blood shed. Regardless of that, Grandfather William Olden Ridgway, at age 24, felt a strong and loyal patriotic urge to serve during a time of great military need. That is, if he could serve without bloody fighting, conflict and active combat duty. Some say the family must have had influence or a bit of political clout in order for this to come about. In 1861, soon after the Civil War started, he lined up and enlisted. Officials found a non-combative place he could serve as a Commissary Officer. Therefore, he never entered into active combat duty nor had to kill or injure anyone. Never-the-less, serving near the front lines, he was later wounded to some degree and was placed on the inactive, disabled list for a time. I have never learned how he was wounded or the extent of his injury. Upon recovery from his wound, it was time for Grandfather William to re-enlist for a second stint of wartime service. He did so, re-enlisting as a Commissary Sergeant and there is where he continued to serve until the end of the Civil War, when he was honorably discharged. Post-Civil War…… By the time he mustered out and got back home to Darby, some of his siblings had already moved out west to California. It wasn’t long before he decided to go west and join them. That was along about 1867 or ’68. Sometime past his thirtieth birthday, he arrived in California and spent the next 30 to 35 years out west. Those 30 to 35 years are just a blur to me. I have never followed up with trace research to try and find anything on his California abode or records there. It is highly probable he had a wife and family in California, which he may have left when, near the turn of the century, he decided to pull up roots and come back east. That is only a possibility I have never documented, but am very interested in doing when the time and opportunity arise. Later, I do find Grandfather William at Starks, Louisiana, in Calcasieu Parish, north of Lake Charles. He was serving as US Postmaster at the Starks Post Office when, in December of 1905 at age 68, he married 21-year old Addie Clark of the large south Louisiana Clark family. He and Grandmother Addie had no live births until my mother was born at Starks in 1913, a two pound preemie, also not expected to survive. She did survive and lived until 1996. She died at age 83 and left three adult children; my two siblings and me. 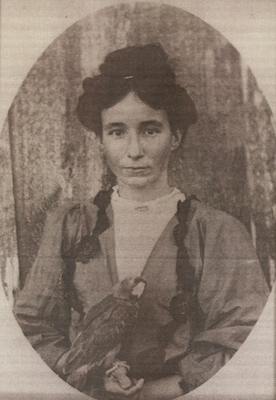 Mother’s only known sibling was a brother, William Oliver Ridgway, my uncle, born at Starks a year after her, in 1914. He died in his late fifties while running a highly successful plumbing business at 7606 Jensen Drive, at Crosstimbers, in Houston, Texas. Grandfather William Olden Ridgway eventually became disabled at the Louisiana postmaster’s job and was soon sent to the ”Old Union Soldier’s Home” in Danville, Illinois. He died there in 1925, at the age of 88 and is buried in the United States National Military Cemetery near the Danville Soldier’s Home. I have visited the Danville cemetery and found his white headstone among hundreds and hundreds of others standing row upon row. Many times I have wished I had known my Grandpa William, but he died fourteen years before I was born. Most of what I know of him came from my mother’s recollection of him. Mother was twelve when grandpa died. He left a young widow alone in deep poverty with two pre-teen children to raise. This story reveals in stark reality how our being, our very lives are often so uncertain, fragile and hanging precariously in the balance. Of how our virtual existence today certainly could not have been. While depending upon how the many uncertain factors, all by chance, came together at the right place and the right time. You see, my grandfather, the Civil War veteran was quite old when my mother was born, in effect skipping a generation…... Thus, go figure; I am a CIVIL WAR GRANDSON.